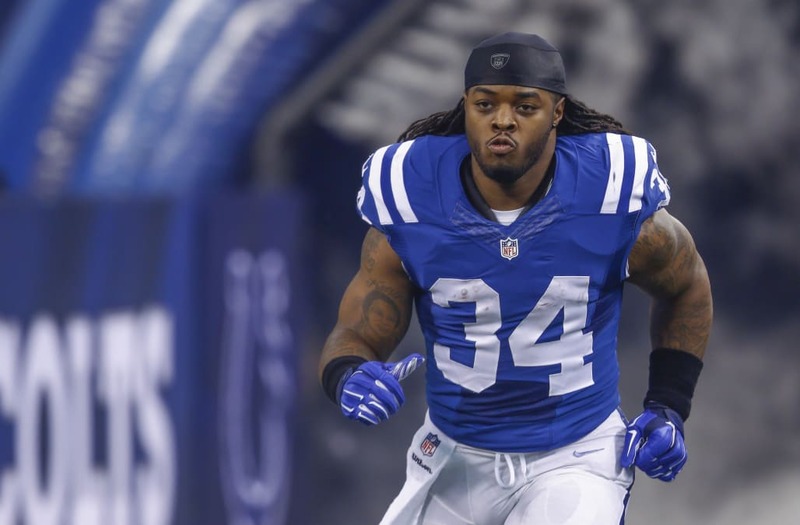 HOOVER, AL (WXIN) -– Former Indianapolis Colts and Cleveland Browns player Trent Richardson was arrested for domestic violence on Thursday in Hoover, Ala. According to police, officer's responded to Trent Richardson's hotel room just after 8 p.m. after emergency dispatchers received several calls about a possible domestic disturbance. Officers arrived at the scene and interviewed Richardson and the female who was with him. Police say the female sustained injuries including scratching and bruising around her face. Hoover Fire Department paramedics were dispatched to check the victim's injuries. She was treated on the scene. Running back Trent Richardson #34 of the Indianapolis Colts walks off the field prior to a game against the Cleveland Browns on December 7, 2014 at FirstEnergy Stadium in Cleveland, Ohio. Indianapolis won 25-24. Alabama Crimson Tide running back Trent Richardson holds the BCS trophy after defeating the LSU Tigers during the NCAA BCS National Championship college football game in New Orleans January 9, 2012. Trent Richardson from the University of Alabama takes the stage during a photo opportunity before the 2012 NFL Draft at Radio City Music Hall in New York, April 26, 2012. Indianapolis Colts running back Trent Richardson (34) spikes the ball after scoring a touchdown against the Houston Texans at Lucas Oil Stadium. Washington Redskins' Robert Griffin III (R) shakes hands with Cleveland Browns' Trent Richardson (L) after their NFL football game in Cleveland, Ohio December 16, 2012. Indianapolis Colts running back Trent Richardson (34) runs the ball with Cincinnati Bengals defensive end Robert Geathers (91) chasing him down during the third quarter at Lucas Oil Stadium. The Colts defeated the Bengals 27-0. Indianapolis Colts running back Trent Richardson (34) runs out before during a NFL football game between the Indianapolis Colts and Houston Texans at Lucas Oil Stadium in Indianapolis, IN. Trent Richardson #33 of the Oakland Raiders is tackled by Gabe Martin #50 of the Arizona Cardinals at O.co Coliseum on August 30, 2015 in Oakland, California. Richardson was arrested and transported to the Hoover City jail. He's been charged with domestic violence, third degree. Richardson was a running back for the Colts during the 2013 to 2014 season after being drafted No. 3 overall by the Cleveland Browns in 2012. He also starred at Alabama, finishing third in Heisman Trophy voting for the 2011 season and winning two national championships with the Crimson Tide.